On the 29th of November 2012, my friend Emeka by name called me and said “Esther I have hurt my girlfriend and she’s mad at me, what can I do? I called her and she’s not answering and she won’t even reply to my messages” so I asked him what does she like? He said she loves cakes and candies, so I suggested we bake a cool cake for her saying “AM SORRY” and taking it to her house. He agreed. I mixed the dry ingredients. Then I creamed 250 grams of butter with 2 cups of sugar, then added a 1/4 spoon of a liquid strawberry flavor and 6 big eggs.I added the powder ingredient and 250ml of liquid milk. Greased my love shape pan, dusted it with flour and added my mixture into it, baked for 45 minutes at 350 degree Celsius. 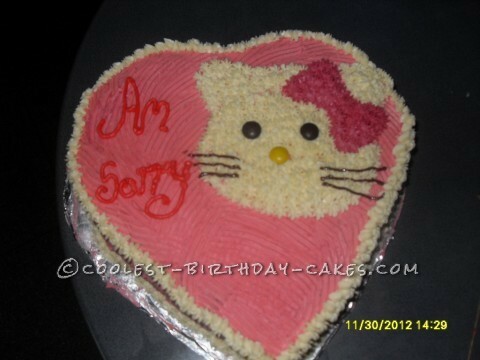 When I was icing the cake Emeka called and said “her best cartoon is Hello Kitty, can you make a design of it”. Then I thought this is a big one, how can I make such a complicated design, but in order not to disappoint him I said I will. Making the small face of a Hello Kitty was not so easy for me being my first time. I had a challenge thinking of what to use for the eyes, nose and whisk and was scared that I might not get the shape of the face. Finally I got a dark chocolate cream for the whisk and the eyes and nose was from a M&M candy. When he came over to my place for the cake he was so happy. It looked good that was when I was convinced it was nice. And the cake did the magic, she loved it as she saw it and forgave him. Finally my joy was completed. Birthday cake idea Posted by Queen E. A. This cake looks very fyne, I do trust dat it will be as tasty! Keep it up. How I wish I can get one of dat. thank you all for your comments and likes,you all are my source of inspiration,you are indeed great friends,over the months i have come to love baking because there is always an inspiration and a challenge to bake,some people give me designs that may seem impossible and it comes out perfect at the end and also to those that trust me enough despite am unskillful to get them a beautiful cake for their birthdays and their expectations have never been cut short. I wish i had so much time to write so much about all my cakes,there is a story behind each of the cakes.